When is it too early to start teaching your children about the importance of saving money and how to save? Never. The sooner your kids learn how to manage money, the better off they’ll be in the long run. Some people think piggy banks are passé, but as a learning tool they’re as important as ever. A piggy bank is a tangible object that can go a long way in showing your child what occurs when money isn’t spent but saved. 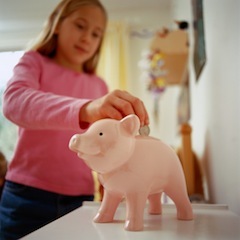 As the money in the piggy bank grows, so will your child’s understanding of the concept of financial conservation. Piggy banks can provide great foundational lessons for younger children. Children tend to learn to respect money when they have to earn it. Requiring your kids to work for their allowance, such as by doing chores around the house, babysitting a younger sibling or making straight A’s in school, can give them a healthy respect for the dollar. This also can help them develop other important attributes such as a good work ethic and gratitude for what they have, by understanding that everything they have comes with a cost. Children can learn how money management works from hands-on experience. For example, take your child to your local bank and open a savings account in his or her name. Let your child participate in the process of filling out forms, such as deposit slips. Share the monthly balance statement with your child, so that your youngster can see the money grow. Parents’ own actions have the greatest influence in teaching their children how to manage and save money. Kids do as they see, so set a good example with your own spending habits. Take your children shopping with you regularly and explain some of the purchasing decisions you make. Create a budget and stick to it. Save up for large purchases, and always shop around before making any final buying decisions. Have any money-saving tips of your own that worked successfully with your kids? Share the wealth with us in the “Comments” section below.